The Achimenes plant is a member of the Gesneriad family and closely related to gloxinias and African violets. Common names for it are monkey-faced pansy, hot water plant (its tubercles refuse to sprout in the spring unless they are warm) and nut-orchid. The Achimenes is old when compared with the infant African violet introduced in 1889. The first achimenes plant or bulbs – the scarlet flowered species Achimenes coccinea – was brought to England from Jamaica in 1778. I saw a pot of achimenes (a-kim’e-neez) about 30 years ago and after realizing the wide diversity in flower form, color and habit of growth, gradually collected 20 or 30 varieties. Flowers appear in the leaf axils, and large, well-grown plants are literally covered with the gleaming flowers which have been compared to single-flowered petunias. Achimenes flower colors are shades of red, purple, blue, pink, white, or variegations of these. The bronze foliage of the Achimenes is somewhat velvety with burgundy color on the underside of the leaf. Some varieties have green foliage. Mature plants are about a foot tall and as wide, if several of the scaly rhizomes are planted in a large pot. Taller plants have a more pleasing appearance when well staked. If the moisture is too low in the air or around the roots, the foliage is likely to brown and the blooms may drop. The bulbs grow from small rhizomes, often called tubers or tubercles, vary in size and shape among the varieties; some resemble small pine cones, others like pipe cleaners. Others are round or pear shaped and colored rose, pink or white depending on the variety. Tubercles may also form in the leaf axils of some varieties in late fall. These will make new plants the same as the underground tubercles. The bulbs like the same care and culture as African violets and are equally rewarding. Achimenes tubercles may be ordered during January and February, and occasionally are available even until the first of May. Most growers ship tubercles by mid-March. Plant them immediately upon receiving them, barely covering the tubercles with soil about 1/2 inch deep, using a very light soil mixture – an African violet soil works as well. Any combination of leafmold, peatmoss, vermiculite and loam will also work. Make sure to label each pot. Do not add manure or artificial fertilizer until the plants are up and actively growing. Many of the reputed failures with achimenes can be traced to the use of manure in the potting soil. My achimenes are planted in 4 to 8 inch pots depending on the number of tubercles I have of each variety. I prefer about 15 tubercles in an eight-inch pot, and four or six in the smaller pots. The larger pots hold the moisture better and produce a mass of bloom. Smaller pots dry out too quickly if they are set outside. To give achimenes an early start, keep room temperatures at 70 degrees or higher at all times and they should come a poppin’. When starting Achimenes indoors, after planting, water the containers lightly and set them in the basement or under a greenhouse bench where they will not get too wet, dry or hot. As soon as the sprouts show above the soil in the spring they should be moved to a lighted window and the soil top-dressed with light fertilizer – outdoors try well-rotted manure. They demand a good amount of humidity in the air, and the soil in their pots should never be dry, but kept rather moist at all times. A weak soluble liquid houseplant fertilizer should be used to fed during the growing and blooming season which is usually June through October (longer for some varieties, which are inclined to start into active growth a little later in the spring). Conditions similar to those suitable for African violets will be satisfactory. They need considerable light, but resent full sunlight except in the early morning and evening. In warm weather I set my plants under a tree where they are sheltered by shrubbery. They are kept moist with the garden hose and sprayed several times on a hot day in their shaded retreat. Achimenes seem to thrive on heat and this trait makes them a life-saver for those with a home greenhouse during the summer months. I know of one home Oklahoma grower who grows 15 or 20 varieties of them in his small greenhouse and they give it color and life which it otherwise would not likely have during that season. No matter where you grow achimenes, give them a loose soil with moisture in the soil and in the air surrounding them, and good light without hot sunshine and you should be successful. Make achimenes one of those “new” plants on your list this year. Order three or six each of at least a half dozen varieties… the tubercles are not expensive, and they give an amazing amount of blossom for so small an amount of time and attention given them. As autumn approaches and the number of flowers decreases, cut down on the water and allow the plants to dry off. After the foliage and stems are dry. Cut the stems above the soil and set the pot, with soil and tubers undisturbed, in the basement or under the greenhouse bench. It is well to keep the soil in the pots just a very tiny bit moist during the dormancy of the tubercles so they will not completely shrivel and die. Do not disturb them until the tubers sprout again in the spring, except to sprinkle the soil with water from time to time if needed. Most cases of loss over the winter are caused by removing the tubers from the soil and allowing them to dry out. If stored in the pot, undisturbed, the tubers are very tolerant of cold, moisture or drying. We have had some varieties survive a few degrees of frost, and most are unharmed at temperatures near;freezing for short periods. The plants will make a fine show if left in the same soil and container for two seasons. If three to five tubers were planted in a 5- or 6-inch pot the first spring, the second season should find the pot full of blooming plants. Repot before the third season, however, using fresh potting mix. 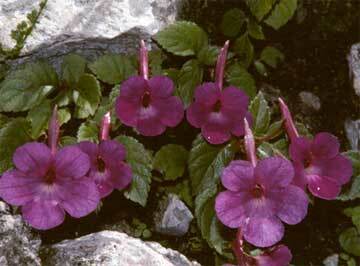 Achimenes increase naturally by their tubers. For most varieties this method will more than supply your needs. If more plants are wanted, however, stem or leaf cuttings, treated in the same manner as African violet leaf cuttings, will produce a number of tubers and bloom in a season. The tubers can also be broken in two or even more pieces; usually each piece will grow. Even the scales of which the tubers are composed can be gently rubbed off and planted like seeds. If handled carefully, and given a gentle bottom heat, many will grow. 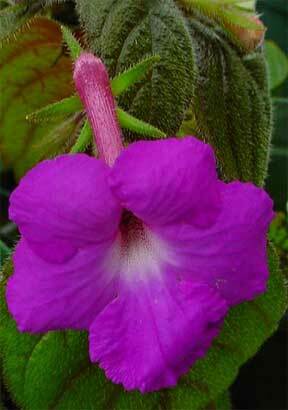 Achimenes seeds, if obtainable, grow easily when given the same care as African violet or begonia seed. Fine new varieties now always being tested for release. It is, of course, impossible to offer a group of varieties which everyone will consider the best, so find colors you like and try Achimenes out. Some varieties show off to best advantage if grown in hanging baskets. If the plant proves to be of hanging growth, the container can be placed on an inverted pot or other stand to permit the stems to cascade gracefully over the sides. For hanging basket, you can find large flat flowers of mottled blue, yellow throat and crimson eye, to dark blue flowers and dark foliage, that will create a sensation. Several varieties developed from the species Achimenes scheeri and have blue-purple flowers like gloxinias and large velvety green leaves like isoloma (tydaea). Last but not least is – Venusta, the oldest Achimenes variety known. This is a medium-sized semidouble of rich purple with very dark blue-purple foliage. Free blooming and of graceful growth, this variety will make an outstanding display. From 1838 to 1850, Theodore Hartweg of the Royal Horticultural Society of London and others searched for new plants throughout the Americas. They are naturalized in Mexico and Central America. Becoming fabulously popular all over western Europe Numerous Achimenes species were introduced into cultivation. Achimenes patens, Achimenes rosea, Achimenes hirsuta, Achimenes longiflora, Achimenes grandiflora and others were widely grown. As would be expected, hybridization began immediately. In 1848 William Backhouse received a Certificate of Award for his hybrid “Venusta”, a cross between Achimenes rosea and Achimenes patens. There are many fine varieties of Achimenes available. 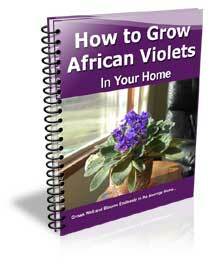 If you love African Violets I know you’ll be enthusiastic about growing achimenes along side your African violets.